This content includes affiliate links. I get a small percentage of the sale for purchases made through links in this post. However, I use each product I review and only recommend those that I like and have worked well. Read my disclosure for more information. 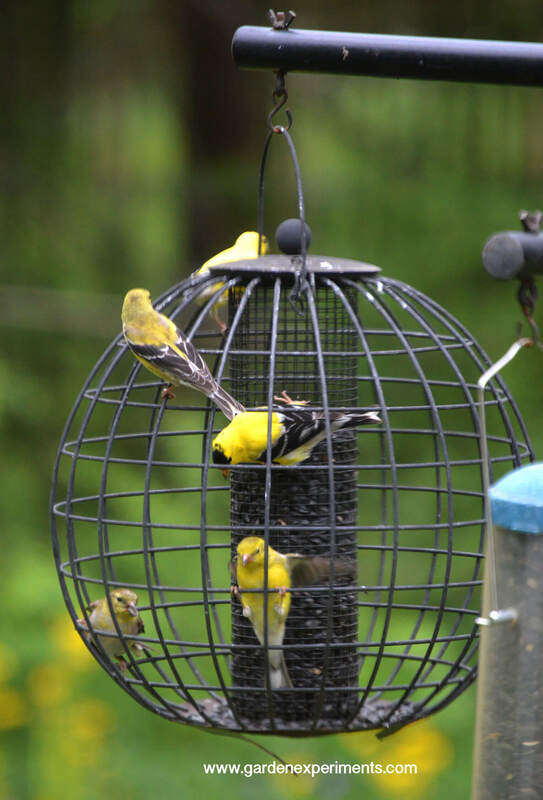 If you would like to see more of the smaller bird species at your feeders but they keep getting chased away by the larger birds or they are in need protection from birds of prey while they feed, then this globe cage feeder would be a good choice. 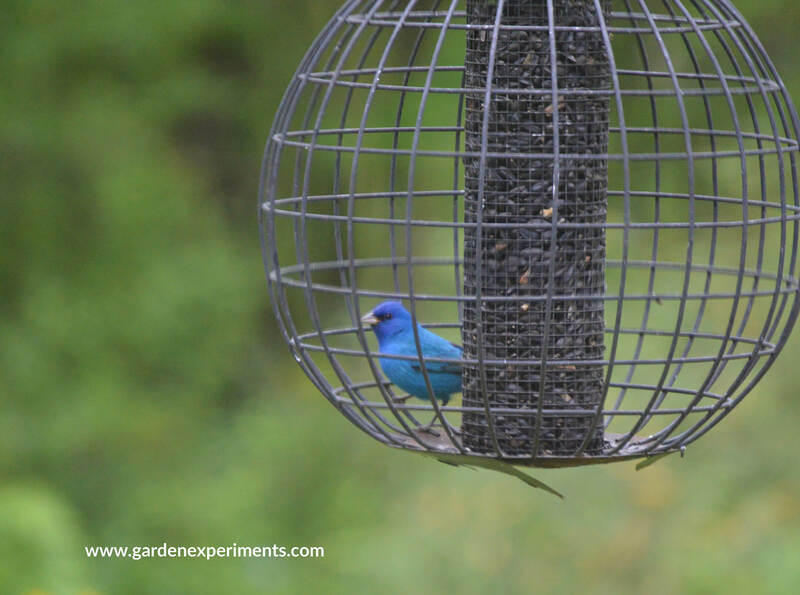 The feeder and the surrounding cage are made of powder-coated steel. It is filled from the top after you twist and lift the cap to reveal the opening. It’s very easy to fill and any spilled seed will land in the platform at the base of the globe. The gaps in the cage that makes up the globe are about 2 inches in diameter and help to exclude larger birds from the feeder. As for its ability to keep squirrels from the seeds, I have my doubts about that. A squirrel is so resourceful, I think it would be able to reach in and get the seeds at the top and the bottom of the feeder. Since my globe feeder is on my squirrel proof bird feeder pole, squirrels are unable to reach the feeder, so I can’t truly say how effective this particular feeder is at deterring squirrels from reaching the seeds. 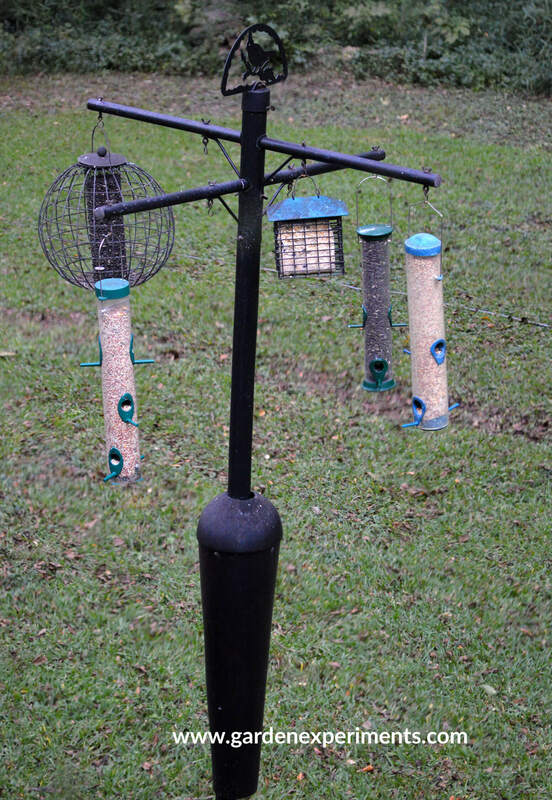 This particular feeder is designed for sunflower seeds, but there is a mixed seed globe cage feeder with four perches. This is a very simple feeder that works particularly well for smaller birds, though I have to admit, they still try to get to the big feeders first, then go to this one after the others are emptied. The lid on the feeder locks by twisting two tabs into the slots on the lid. It’s a little tricky to get it in the correct spot, but once you know that you have to match the notches up, you’ll pay more attention to getting it on correctly. The notches prevent squirrels from opening the feeder from the top. My biggest concern with this particular feeder is that the paint starts to peel off of it after a couple of years and the base will start to rust. As with any modern outdoor metal furniture or feeders, this is a problem. You can scrape off the paint chips, sand off the rust and repaint it with rust-preventing spray paint, or leave it as it is. I have had my feeder for three years now and I leave it up year round. It is peeling and is starting to show rust, but it is still quite functional. One other minor issue I have had with this feeder is that the hanging loop sometimes flops down when I am trying to hang it on my bird feeder pole. Since the pole is much taller than I am, I have to rely on the hanging loop to stay standing up to be able to attach it without using a ladder. It’s not a big concern, but sometimes it does frustrate me. UPDATE: After 5 years of owning this feeder, the bottom metal plate has rusted through entirely. I am going to attempt to affix some screen to the bottom of the tube that will continue to keep the seeds in the feeder and see if that will solve the problem. Read the review for multiple tube feeders here. NOTE: This article includes affiliate links. This feeder was given to me as a Christmas gift from a friend a few years back (I’m a bit of a backyard birding enthusiast) and I am reviewing it based on my experience of the few years of using the feeder in the conditions of my backyard in zone 7b. This simple little device is awesome! It makes it so easy to fill up a feeder. Rather than taking the bag and attempting to aim the seeds into a small opening, you can scoop them out and make sure you don’t miss a single seed! My only problem with this scoop is that it occasionally gets clogged when you are working with sunflower seeds – you just have to shake it a little to or close and open the damper to get it going again. The scoop is made of heavy plastic, so it’s very durable. I’ve had mine for 3 years now and it works the same as it did the day I purchased it. HOW IT WORKS: Use it as a scoop to scoop seeds then stand it up right and open the damper to let the seeds go into the feeder. Great for hitting a small hole. HINT: Always check to make sure damper is closed before you fill it. Damper allows you to stop the flow of seeds easily so you don’t overfill. My solution to preventing squirrels from getting to the birdseed is to keep them from getting to the feeders. The only thing that has ever worked for me is to hang my feeders on this is the Squirrel Stopper Pole. Despite the claims of many birdfeeders, I have found that once a squirrel reaches a feeder, they will find a way to get to the seeds. I’ve seen squirrels hang upside down by their toes to be able to pull seed out from a port and feed on it. I’ve had my squirrel stopper bird feeder pole for several years now and I still love it. It keeps the squirrels from ever reaching the bird feeders since they can’t climb up the pole. Read more about this pole.